The therapeutic tools of psychoanalytic practice have not only informed the work of CASSE but been instrumental in thinking about trauma, cultural ruptures, relationships, couples, families, linkages and transformations. We apply psychoanalytic tools to alleviate suffering. We respond to need and suffering. We adopt a stance of enquiry and exploration with curiosity and interest and with no agendas or judgements. We value self-determination. 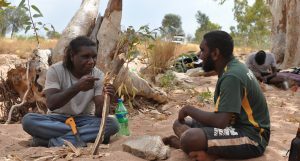 We meet people where they are, offer unconditional acceptance, (as Aboriginal people have always done with me), providing a safe and supportive place, deep listening to stories of pain, talking together, sharing together, reflecting together, thereby catalysing change and achieving (the past in the present) transformations and new relations, experiences and realities. We provide a holding container for thinking and develop the so-called analytic third which, put simply, is deep thinking between two or more people, families, communities, organisations which creates a third, that is new and deep encounters. We have hard conversations and help people talk about what may not yet be articulated, about what worries them, troubles them, in order to move forward. We don’t know what the outcomes are as they are discovered and generated mutually. When we know what troubles people, when we know more about the need, (which will then be an outcome and a meaningful one to both parties) then we can all move forward. Psychological change we believe comes from recognition. Suffering is alleviated through mutual recognition and feeling which helps healing. Without recognition there can be no self-recognised. 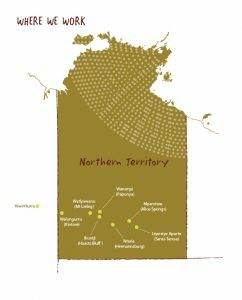 Self for Aboriginal people out west is inextricably tied to country. This is what they tell us out west. And you will see how different the notions of Pintubi well-being are to the western views of mental health. This is why CASSE works on country. Aboriginal place, or “country”, is a network of sacred places linked by paths walked by ancestral beings of the Dreaming or Tjukurrpa (honouring the Aboriginal preference, in the words of Dr Jenny Green, 2012, p. 177, not to be translated) and these paths are continually walked by living people who own and take care of them. Song lines form a narrative history. Each person has a relationship with country and with each other through the Dreaming stories. Country is replete with meaning and the matrix of meaning designates the movements of ancestral beings and the journeys of those today journeying and conducting ritual practice. With the Pintupi people there is an emphasis on relatedness (Myers, 1991, p. 63), autonomy and “looking after”; the country holds, looks after, grows up and in turn, is held and looked after. The people and the landscape are from the Tjukurrpa. The world is divided into what is visible, seen and real (Mularpa) by virtue of what is witnessable and the Tjukurrpa (dreaming) (Myers, 1991, p. 49). The Tjukurrpa provides the fundamental source of identity and place. It is timeless and unchanging and erases the historical, unifying the past and present in one eternality. Human action is not considered the causal result of contemporary creations or choices but is informed by the Tjukurrpa. It is an order of mythological ancestors to which all is subordinated and the events of the visible world are reflections and representations of an ontological prior set of events. Waltjya, family, namely relatedness, the self in relation to others, is a key principle of the social order, and Pintupi people see and feel themselves to be related to kin (Myers, 1991, p. 109). There is no self without kin. One becomes complete and autonomous only through sustaining relations with others. The identity of self is embedded in mutual relations with others and with the Tjukurrpa and “one’s story”. The being of people visibly transforms and relations are strengthened, when they are visiting or back on country, revisiting the ancestors and songlines. Space and the orientation of themselves and events in space is very important to Pintupi people (Myers, 1991, p. 54). Geographical location, where events occurred punctuate any narrative and sacred spaces and places entail stories and movements of ancestral beings. In the desert, the dreaming tracks and song lines crisscross the land and the narratives of ancestralised beings are memorialized in the topography of the land rendering sacred sites. There is a culturing of space because home, temporary as it maybe, is on country. The temporary or nomadic nature of the camp belie the underlying permanence and significance of country. Both temporary camp and enduring country are ngurra- home where one belongs with family. There is ownership and narrative of “named place” (Myers, 1991, p. 91) – “that’s his story” – and with it are sacred objects and boards. The land, their space, is however a continuous entity, that is, no fences, but there are owners and custodians, in a way, yours and mine, to the land. One’s own country, ngurru walytja, is a place of security (Myers, 1991, p. 151). With respect to cultural transmission, there is generational succession, governed by cultural protocol, and the elders “give” the knowledge to the young men, with an emphasis on giving and legitimacy in receivership (Myers, 1991, p. 152). The transmission of knowledge is considered a vital responsibility. Knowledge is “given” which is held in side his stomach with his spirit kurrunpa. This inherited knowledge is localized and given according to seniority. If there is danger or conflict or trouble there is a return to country; to the knowledge base, for protection. The cultural knowledge is highly valued and who owns it and who can speak for it, is treated with great respect. The emotional world takes place in the stomach where the spirit is located. Kulininpa is the word for thinking, hearing and understanding (Myers, 1991, p. 107). The organ of thought is the ear. Ramarama indicates a deafness and a not knowing or insanity (Myers, 1991, p. 108). There is only one word in Luritja for mental illness. The emotional world is inextricably linked to the Tjukurrpa and to country. Sorrow is for example evoked “in memory” of the ancestors which can be heralded at times of ceremony or ritual. There are physical demonstrations of emotions, aggression and sorry business, with cutting on the chest or stoning the head drawing blood in grief. Aliveness and celebration is evoked by being on country, holding country and dancing on country. Feeling happy is described as a rising of the spirit (Myers, 1991, p. 111). Holding, kanyininpa, Myers says, is a key cultural value, derived from ritual ceremony and links walytja, ngurru and tjukurrpa (Myers, 1991, p. 207). Kanyininpa is holding, looking after, caring, nurturing, caring –at time of law but for everyone there are holding men and the country holds. One can now understand the catastrophic effects of colonialism on the cultural life of the Pintupi marked by dispossession and the incursions and displacements of settlement life and the cattle stations. One can now understand the losses sustained by Aboriginal people. Cultural life has been severely eroded but it has survived and currently is being feverishly revived before the old people die with the stories and song. One can see marked differences between the Aboriginal and western modern worlds. One can see the different notions and significances of self, place, couple, family and home and country for social and emotional well-being. Aboriginal views of mental health and social and emotional wellbeing are very different to those of non-Indigenous Australians One can also see a nexus between Aboriginal and psychoanalytic worlds in the importance of place, holding, relatedness, narrative, sacredness, potential spaces, and dreaming. Aboriginal people also experience poorer social and emotional wellbeing outcomes than non-Indigenous Australians. For instance, among Aboriginal adults high or very high levels of psychological distress are nearly 3 times the rate of non-Indigenous adults. Rates of intentional self- harm among young Indigenous people aged 15–24 years are at least 5 times the rate of non-Indigenous young people. 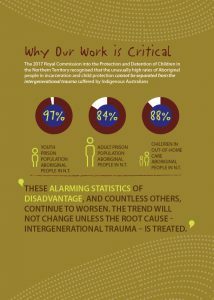 Transgenerational trauma is manifest in high rates of incarceration, violence, suicide, substance usage and more. Until trauma is recognised, talked about, and experienced the violent enactments will continue. Of course the recognition is two-way. We work on country! There has been no violence on our cultural camps. Happy faces, laughter and alive, ”good” feeling states and purpose are evident when people go to country or engage on our cultural camps. 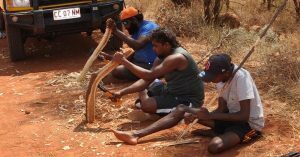 Tjupurrula, the manual therapist and skilled traditional tool maker has relatedness and kin among the people-he builds relationships. When he can he works alongside ngangkaris and elder men who hold the knowledge of the lore. He provides a link to both worlds. He works from the heart. Holding is provided in the continuity of cultural revival, in the evocation of mourning for ancestors which heralds concern and reparation in the person, in the receptivity to what is needed, in the recognition of what is valued culturally, in the provision of belonging to place which affirms identity and what has been nameless is represented in the making of tjilirra, in the telling of old and new stories, in walking the tracks on country of ancestral beings, reviving stories and song and in restoring unlived parts of self to the living. Years of catastrophic violent emotional assaults which can leave a dispossessed people eroded, damaged, weakened in spirit, devitalized, unable to symbolise the real – well these years can be and are experienced on country, then moderated and trauma becomes bearable, thinkable, felt, survivable, dreamable and real. Sorrow, lament, meaning, connection and responsibility is embedded in the culturally sacred, “in memory”. People no longer then say as the senior headman did- “If we do not have these we have no language, no culture. We have nothing. We are nothing. It’s our history. A part of us”. Instead, they stand up and say: “We are proud”. 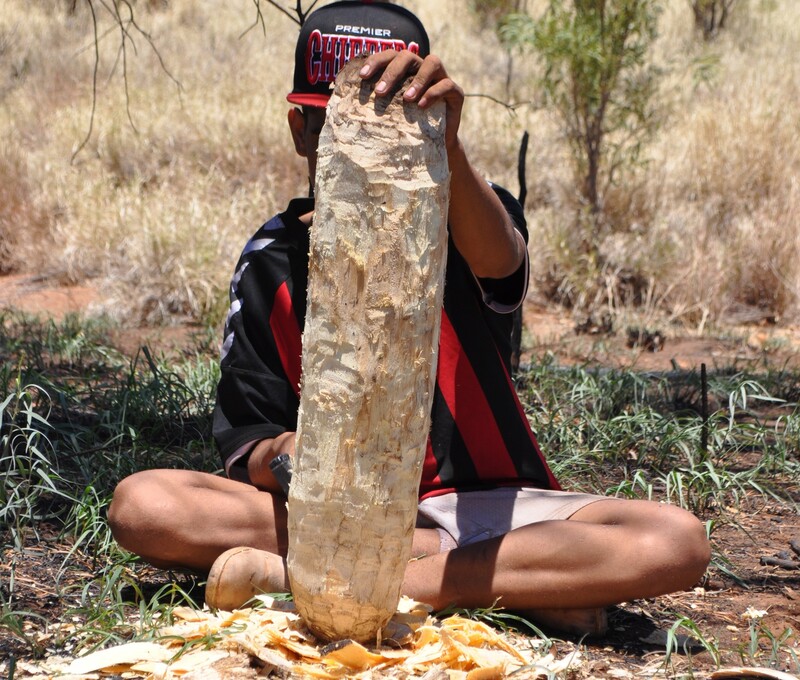 As Martin Jugadai, ngangkari (traditional healer) says: “Making tjilirra is special-it is the spirit of our grandfather inside you”. Green, J (2012). THE ALTYERRE STORY – ‘SUFFERING BADLY BY TRANSLATION’. The Australian Journal of Anthropology (2012) 23, 158–178. Myers, F. (1991). Pintupi Country, Pintupi Self. Berkeley: University of Californian Press.